I joined Sailthru two years ago. It was sixty of us, most of us in New York. We were all holding on to the proverbial bull together, trying with all our might not to get thrown. Doing everything to sell, everything to grow, everything to hold on for another second. Fast forward two years, we are now over 160 people strong, have quadrupled revenue, and have teams in London, San Francisco, and Los Angeles. Much is the same. The pace is break neck. The extremes are regular. There’s never enough time. But something huge has changed: the bull remains, and we’re no longer fighting it, we’ve harnessed it. We know where we’re going and how we will get there. We are one with the bull. We ride it gracefully. What got us here? I was thinking of this question after reading a recent HBR blog post on setting priorities and using time wisely at mid-sized companies. There a few answers that came to my mind, but the real standout was: leadership. Strong leaders set the right priorities and empower a team to drive it to success. Without proper leadership and management, too many are headed in the wrong direction or in too many directions at one time. 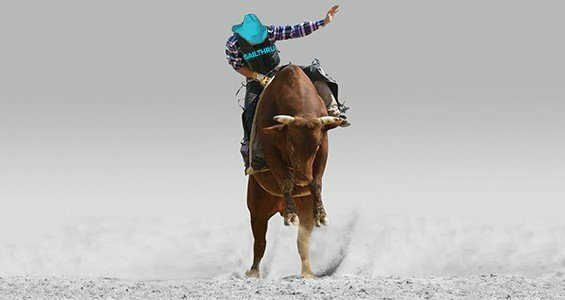 You can never ride the bull like that. 1. Look for hunger in the belly when hiring for leadership roles (really all roles). Potentials have studied your company before they interview. They already know where to start. They are thinking like they already work for the company. 2. Understand what a good leader is before you try to hire for one. You are not born with this knowledge! There are requirements for the role. There are many, many books on this stuff. Read them (not all of them!). Also, watch Band of Brothers episode #7. 3. Understand the management component of leadership. A leader must want to manage. Must enjoy growing and stretching people. Must be able to have honest conversations about performance. Must be able to fire people. Must be able to build a plan and set goals and drive the team towards beating those goals. There are many, many books on this stuff, too. Read them (again, not all of them) and watch Band of Brothers episode #2. 4. Hire better leaders than you. They will expand you and the company in ways you never imagined. Be open to learning from other leaders, even the ones that report into you. Bottom line: You don’t have to be a good leader to hire a good leader. 5. Build from within. Give the budding leaders supervisory responsibilities. Provide them with training. Encourage them to head up projects. Let them follow their interest path. Pat them on the back. Review these stars with the exec team on a weekly basis. At our Sailthru exec team meetings, our first agenda item is to call out wins and who’s responsible for them. We give people Admiral Awards at our All Hands to recognize exemplary behavior. 6. Own the law of “nipping in the bud.” If you’ve hired a bad leader or manager, you must take over. You must stay close to the situation and set up a plan for success. A bad manager will cripple a team and send negative shock waves through the organization. 7. If you can afford it, hire a VP People sooner than later. 75 people was the breaking point for us. 8. Think about working with a leadership coach. Find one with the right mix of IQ and EQ. The right one is a game changer. I would love to hear your related thoughts, questions, and experiences, please share in the comments. David Blanke is the COO at Sailthru. Before joining Sailthru, Blanke led a business intelligence company at the Financial Times/Pearson. He enjoys chess, astronomy and camping. Follow him at @davidmblanke.